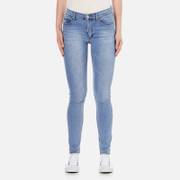 Women’s ‘Mid Spray’ skinny fit blue jeans with a medium rise and a washed finish from Cheap Monday. Crafted from a stretchy organic cotton blend, the five pocket jeans are detailed with front pockets that are sewn shut, faded whiskers on the thighs and steel finish hardware. Complete with a top button closure and zip fly, belt loops and a white leather brand patch on the rear waistband. 79% Organic Cotton, 19% Polyester, 2% Elastane Model is 175cm/5'9 and wears a size W26-27. 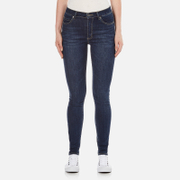 Women's 'Second Skin' high waisted skinny jeans from Cheap Monday with mid-weight, stretch denim construction and dark blue wash. Cutting a high rise, the skinny jeans with soft placed whiskers feature classic five pocket styling, a zip fly and silver toned rivets. Complete with contrast topstitching, belt loops and branded waistband patch. - K.N. 99% Cotton, 1% ElastaneModel is 180cm/5'11 and wears a size W27/L32. 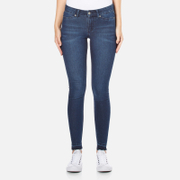 Women's 'Second Skin' high waisted skinny jeans from Cheap Monday with mid-weight, stretch denim construction and light blue wash. Cutting a high rise, the skinny jeans with soft placed whiskers feature classic five pocket styling, a zip fly and silver toned rivets. Complete with contrast topstitching, belt loops and branded waistband patch. - K.N. 99% Cotton, 1% ElastaneModel is 180cm/5'11 and wears a size W27/L32. 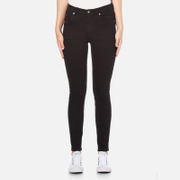 Women’s ‘Second Skin’ skinny fit black jeans with a high rise from Cheap Monday. Crafted from overdyed mid weight denim, the stretchy five pocket jeans are detailed with tonal stitching and antique silver finish hardware. Complete with a top button closure and zip fly, belt loops and a tan leather brand patch on the rear waistband. 99% Cotton, 1% Elastane Model is 175cm/5'9 and wears a size W27/L30.